January 17, 2012-U.S. Fish and Wildlife Service-On the verge of another season of winter hibernating bat surveys, U.S. Fish and Wildlife Service biologists and partners estimate that at least 5.7 million to 6.7 million bats have now died from white-nose syndrome. Biologists expect the disease to continue to spread. White-nose syndrome (WNS) is decimating bat populations across eastern North America, with mortality rates reaching up to 100 percent at many sites. First documented in New York in 2006, the disease has spread quickly into 16 states and four Canadian provinces. Bats with WNS exhibit unusual behavior during cold winter months, including flying outside during the day and clustering near the entrances of caves and mines where they hibernate. Bats have been found sick and dying in unprecedented numbers near these hibernacula. Estimating the total number of bat deaths has been a difficult challenge for biologists. Although consistent population counts for federally listed endangered bats, like the Indiana bat, have been a priority for state and federal biologists, establishing population counts of once “common” bat species, like little brown bats, was historically not the primary focus of seasonal bat population counts. More than 140 partners, including tribal, state and federal biologists and bat researchers convened in Carlisle, Pennsylvania for the 2012 Northeast Bat Working Group (NEBWG) meeting last week to discuss challenges facing bat research, management and conservation. 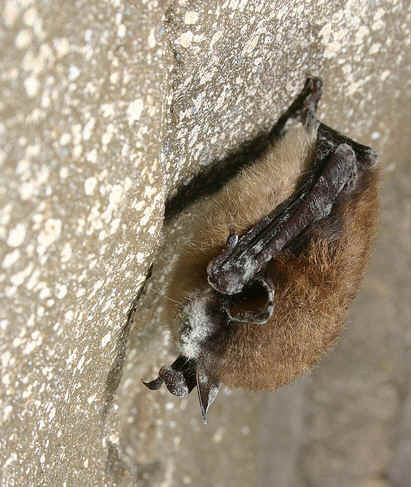 Coordinating with wildlife officials in Canada, the group discussed population-level impacts to hibernating bats and developed the estimate of bats lost to WNS. In addition to the lack of population data for many bat species, there has also been a lack of consistency in how bat population data was reported among agencies. As part of the May 2011 national WNS response plan, which was developed by the Service in partnership with a team of federal, state, tribal, and NGO scientists, agencies are addressing this by establishing methods for consistent data collection. The National Plan for Assisting States, Federal Agencies and Tribes in Managing White-Nose Syndrome in Bats provides a framework for the coordination and management of the national WNS investigation response, and the Service leads an extensive network of partners in implementing the plan. The Service serves as the primary resource for up-to-date information and recommendations for all partners, such as important decontamination protocols for cave researchers and visitors and a cave access advisory that requests a voluntary moratorium on activities in caves in affected states to minimize the potential spread of WNS. In addition to developing science-based protocols and guidance for land management agencies and other partners to minimize the spread of WNS, the Service has funded numerous research projects to support and assess management recommendations and improve our basic understanding of the dynamics of the disease. For more information about white-nose syndrome, visit www.fws.gov/whitenosesyndrome. Connect with our Facebook page at www.facebook.com/usfwswns, follow our tweets at www.twitter.com/usfws_wns, and download white-nose syndrome and bat photos from our Flickr page at http://www.flickr.com/photos/usfwshq/collections/72157626455036388/.